Many day-trip excursion boats leave from Marseille's Vieux Port to explore the surrounding seas—a fine way to spend a day in Marseille. Excursion boats leave from the Quai des Belges at the head of the Vieux Port, for excursion trips ranging from an hour to a full day. There are two main companies. The dock at the southeast corner of the Vieux Port opposite the Cours Jean Ballard is the larger, with more departures, which we prefer. The dock at the northeast corner of the Vieux Port is smaller. 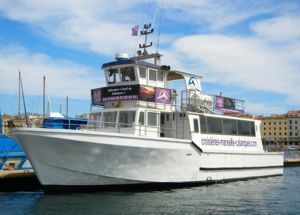 I love any excuse to get out on the water, and a boat excursion not only takes you to interesting destinations, but also provides wonderful views of Marseille, the Vieux Port, the historic forts, the coastline, and of course the fjord-like calanques. To the east of Marseille, along the southern coast of France, are a number of calanques, beautiful narrow channels of water reaching inland, framed by high cliffs. Though they look similar to fjords, they were not formed by glaciers. 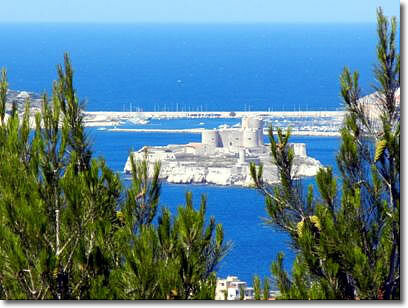 Boats also go to the Château d'If, the former island fortress turned prison that dates from the 17th century. On the island, you can visit cells that were used for prisoners. However, the Château d'If is perhaps best known for its fictional prisoners created by author Alexandre Dumas. In Dumas's The Count of Monte Cristo, the Count himself and the Abbé Faria were imprisoned here. The shortest voyage in Marseille is Le Ferry Boat, the passenger ferry (50 centimes) that traverses the Vieux Port, linking the Hôtel de Ville and the Place aux Huiles every 10 minutes. Excursion boat in the Vieux Port.